There are five different breeds of lop-eared rabbits that are recognized by the American Rabbit Breeding Association. These are the mini lop, French lop, Holland lop, American fuzzy lop and English lop. Despite all having lop ears, these breeds have a range of differences between them. Although called a mini lop, this breed of lop isn't actually the smallest around. Their adult weight is usually between 5 1/2 and 6 1/2 pounds. They're small and muscular, with thick legs, deep chests and broad shoulders. The breed has been recognized in the United States since 1982. These rabbits can come in almost any color, but not all of these are accepted by ARBA breed standards for showing. Recognized color groups for the show ring include shaded, wide band, ticked and agouti. French lops are the largest breed of lop-eared rabbit. As adults they weigh between 10 and 13 pounds. They were first bred in France in the mid-19th century by mixing English lops with wild rabbits and with a giant breed not dissimilar to the Flemish giant. Their coats are dense and their fur is soft and medium-length. Recognized colors include brown, fawn, black, orange, blue and steel. They can either be solid colored or have white markings on their legs, head and chest. 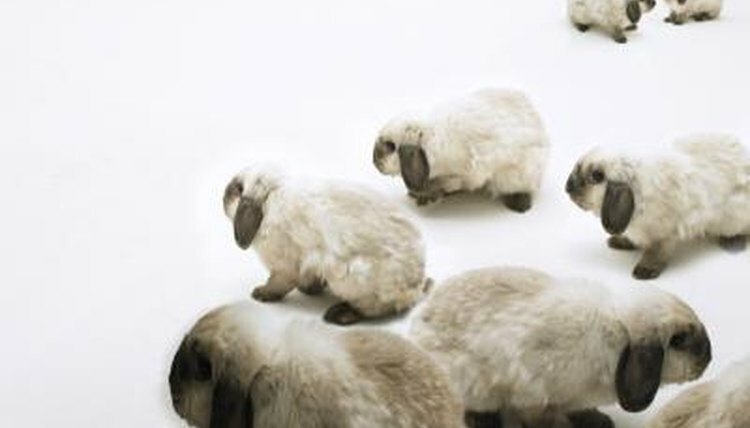 Holland lops are the smallest of all breeds of lop. Accepted adult weight for show rabbits is between 2 and 4 pounds. It's not uncommon to weigh slightly over 4 pounds, but these rabbits would not be able to be entered in shows. They're a compact-type rabbit with a naturally upright stance. They should be short, with deep shoulders, a high head and a good top line. The name says it all where American fuzzy lops are concerned. This breed of lop-eared rabbit is extremely fuzzy and fluffy, with hair at least two inches long. It's thought they were created by crossing Angora rabbits with Holland lops. Adults of this breed should weigh no more than 4 pounds if you want to show them. ARBA-recognized color groups included pointed white, agouti, shaded and broken. The English lop is the oldest breed of lop-eared rabbit that's still around today. They're large rabbits, with adults weighing roughly 11 or 12 pounds. They're much more slender than other breeds of lop and have longer ears, which can measure around 25 inches from the tip of one ear to the tip of the next. They're a short-haired breed, and their coats can come in sooty fawn, black or fawn, either with or without markings.